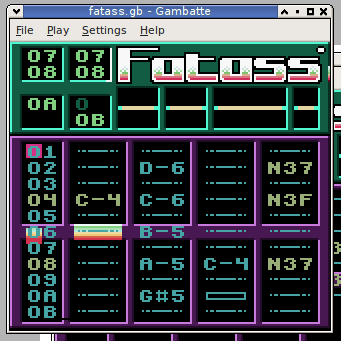 Many years ago I made a Fast Tracker II clone for the Gameboy Color called Fatass. It was coded in pure z80 assembly, and was used to create music for several videogames. I originally imagined myself writing entire albums with this thing on my travels. You will need a gameboy color or gameboy advance emulator, or a flash system to use this. Subscribe to comments with RSS or TrackBack to ' Fatass '. the tracker looks amazing. i’ve been trying to load it onto a bleep bloop non usb cartridge with the usb transferer. every time i try to load it onto the cartridge it says: >Bad file size. any ideas why? i would love to use this. thanks! i’ve not tried to load it to that kind of cartridge before. I always used the nintendo flash carts or the now impossible to find lik sang variety. USB was pretty exotic back then. I don’t have any gb dev hardware any more, maybe the guys at chipmusic.org can help? The emulator I’m using displays the block list incorrectly ( screenshot http://i.imgur.com/VwBEq.png ). I want to know if this displays correctly on a real gameboy colour, so I can file a bug with the emulator. I have changed the background colour, and now it displays correctly. This seems to only happen if Fatass formats the SRAM when it’s started up. Changing the background colour doesn’t seem to fix it after all. @baseck: probably due to bad header data (rom size) – use rgbfix or any other header tool to fix it and try again. just checking it out, really cool – is there a way to set pattern length? Are you thinking about updating it any day?